The illustrated view, is taken from a similar spot as a drawing illustrated in P. Conner, George Chinnery 1774-1852 Artist of India and the China Coast, Woodbridge, 1993, p. 203, pl. 131, and is dated May 13 40. The present drawing was executed a little closer to the flagpole, but similarly concentrates on the fishermen in the harbour. A watercolour in Conner, op. cit., pl. 62, illustrated in colour, shows a similar view. The fisherman's hut in the present drawing is missing from the watercolour. A similar vessel to that in the unillustrated drawing is illustrated in R. Hutcheon, Chinnery the Man and the Legend, Hong Kong, 1975, p. 146. 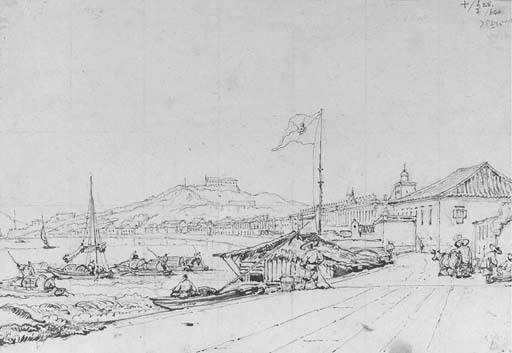 Chinnery moved to Macao from India in 1825, and remained there until his death. He is buried in Macao. We grateful to Patrick Conner for his help in preparing this catalogue entry and those for lots 103-106.